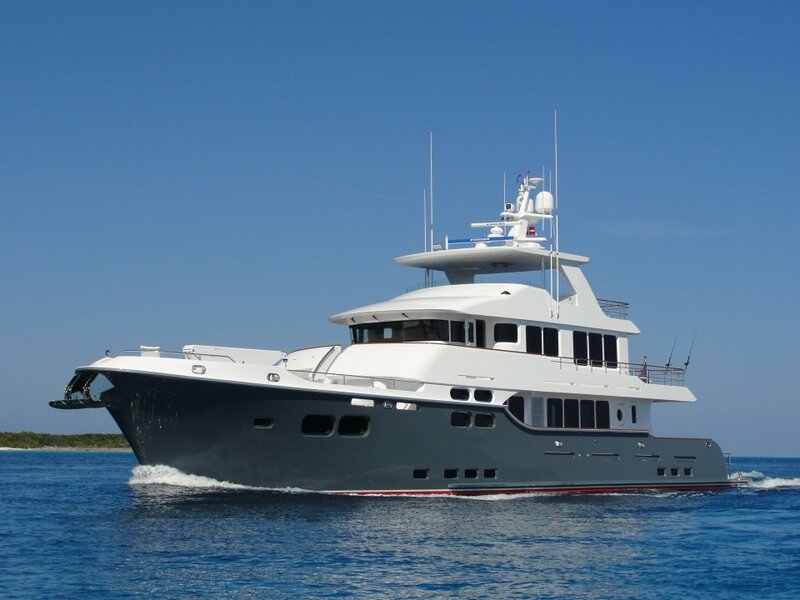 Nordhavn 96 steps up the massive scale of the 86 and adds a further 10 feet midships. 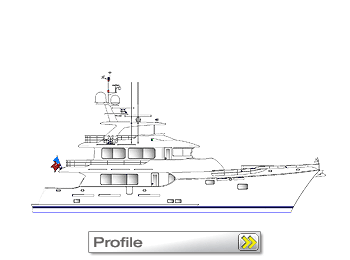 The 96 is new model, adapted from the successful 86, adding custom mouldings at the time of manufacture to add a further 10 feet to the whole vessel, allowing her to compete favourably with vessels in the 100 foot + category. For N86 specs, follow this link. 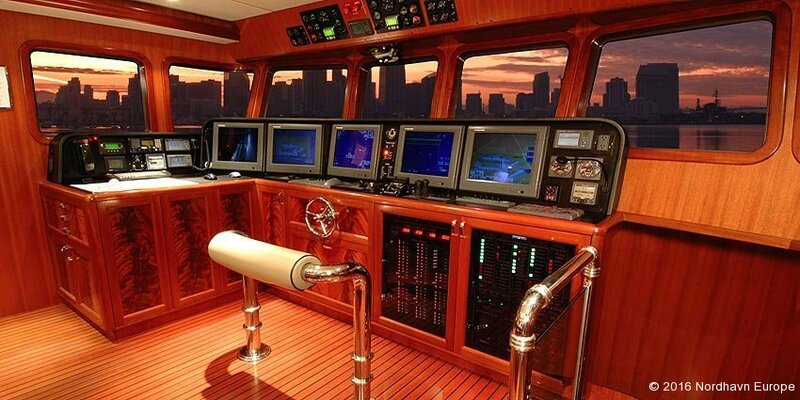 Building on the experience of hundreds of thousands of ocean crossing miles and applying the “form follows function” rule, this ultimate offshore passagemaker has been designed in an aft wheelhouse configuration. 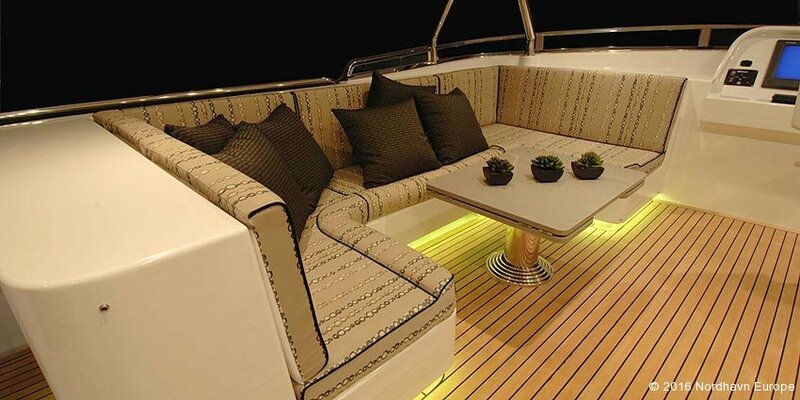 For comfort and visibility at sea, this arrangement cannot be beat and with her long foredeck, tenders up to 20 feet can be accommodated. There is no question the Nordhavn 96 is a large yacht. The first impressions from the outside are of great mass and powerful lines, but it’s the interior volume that has to be experienced to be appreciated. Taking advantage of the enormous capacity of this hull, the new Nordhavn 96 offers accommodations that are nothing short of remarkable. 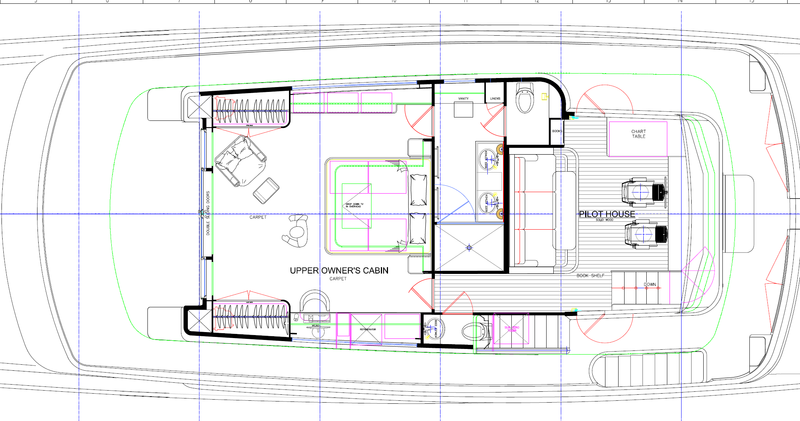 The saloon and galley measures 36 feet in length, the master cabin and head are full width consuming the whole forward/upper section of the vessel and the combination of wheelhouse, captain’s cabin and sky lounge measure almost 30 feet in length. 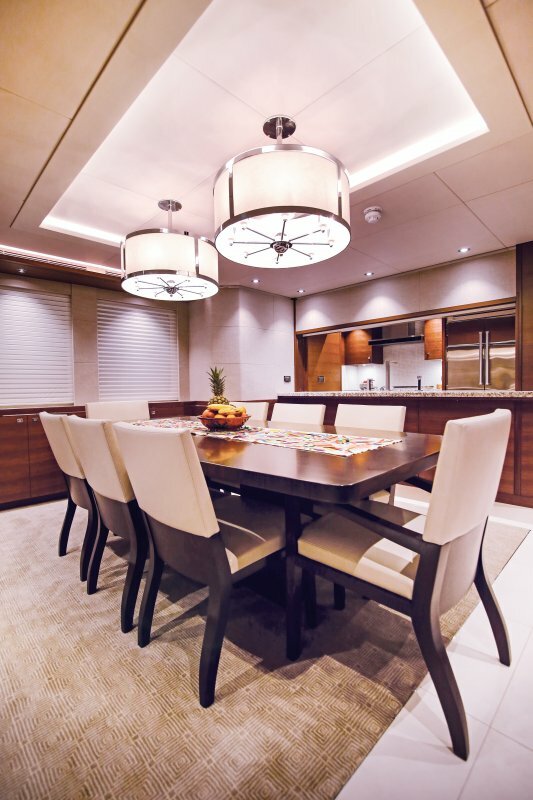 In addition to the master stateroom and captain’s cabin, the vessel includes three guest staterooms with ensuite heads and an additional crew cabin and head aft with an interior and exterior entrance. A laundry and utility room are also provided. The luxurious and functional interior is finished with fine hardwoods, beautiful moldings and raised panels combined with stone floors, granite countertops, the finest hardware, lighting and fixtures. 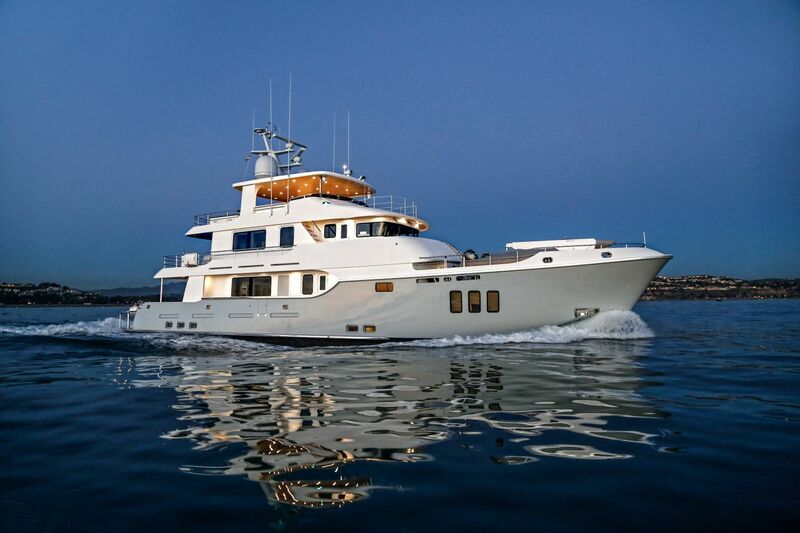 The Nordhavn 96 is designed for customization, and most owners elect to engage professional interior designers. Some suggest alterations to layout, but all use furnishings, textures and colors to imprint owners’ personalities and tastes. 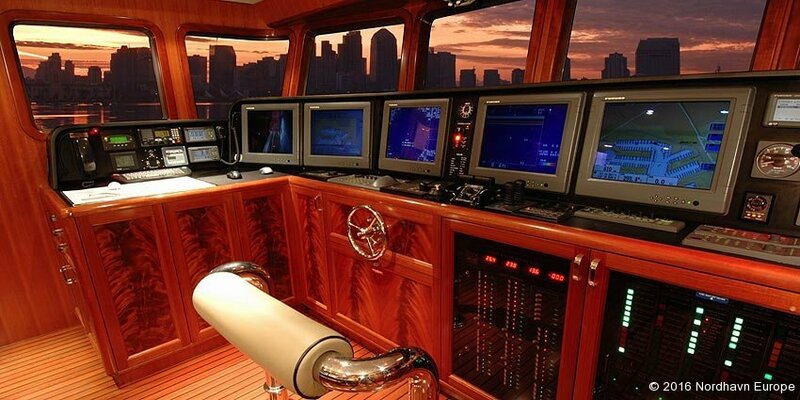 Thus, each of the yachts launched to date is, effectively, unique. Finishing choices also result in interiors with remarkably different appearances and “feel”. 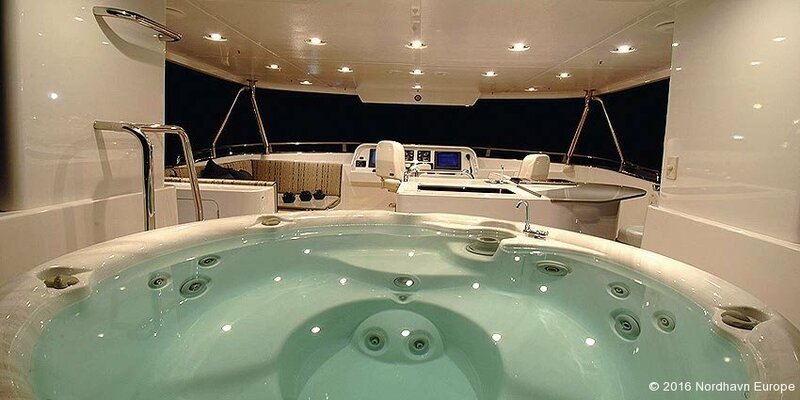 Construction of the N96 is conventional fiberglass, built to extremely heavy scantlings using beautifully constructed female molds for the entire hull and deck. Starting with a seamless, flawless structure, a highly detailed gelcoated finish possible only with this molding process, she will then receive a complete Alexseal paint job prior to assembly. 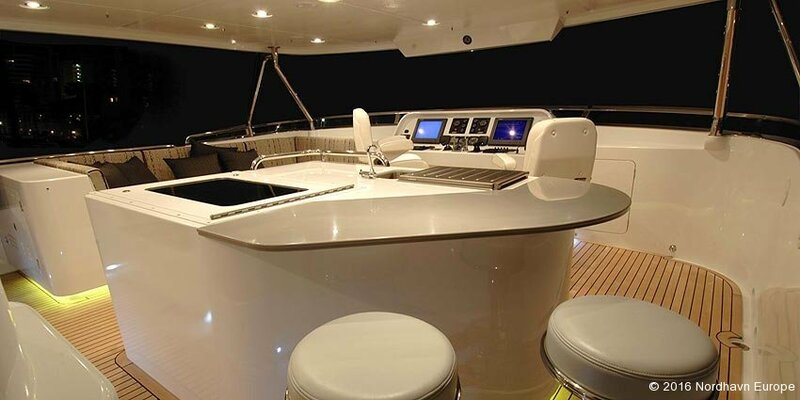 A combination of the highly detailed molding and the superior luster and maintainability of the Alexseal paint will result in a yacht finish that is to the highest possible standard. Designed and built to the latest international standards, each new Nordhavn 96can be built to ABS certification with +A1 Yachting Service rating for the hull and AMS rating for machinery and installation as an option. 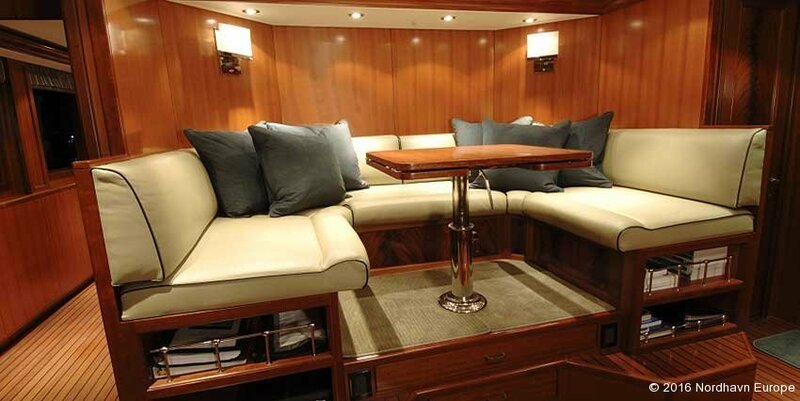 With all the discussion of the N96’s enormity, she presents the ideal juxtaposition: her beamy interior offers the sense of being on a much larger boat yet she handles like a much smaller one. efficiency and reliability never before possible. 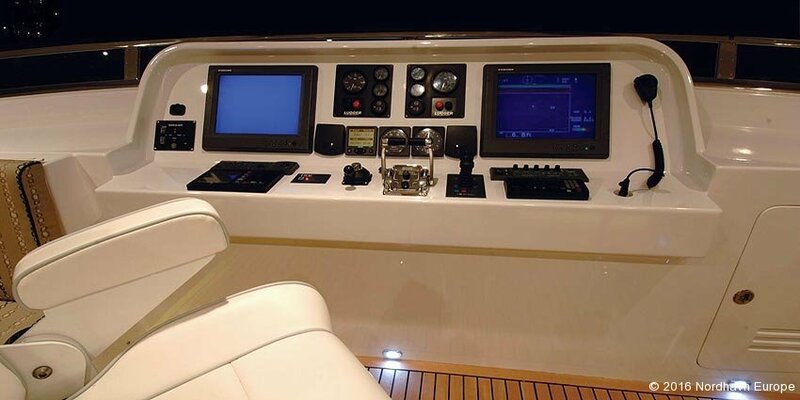 An extensive list of standard machinery details includes central hydraulics with 20-square-foot stabilizers, 50 hp bow and stern thrusters, hydraulic bilge pumping and anchor wash downs, dual Onan generators, a universal AC electrical system for world wide use, 3,500 lb. 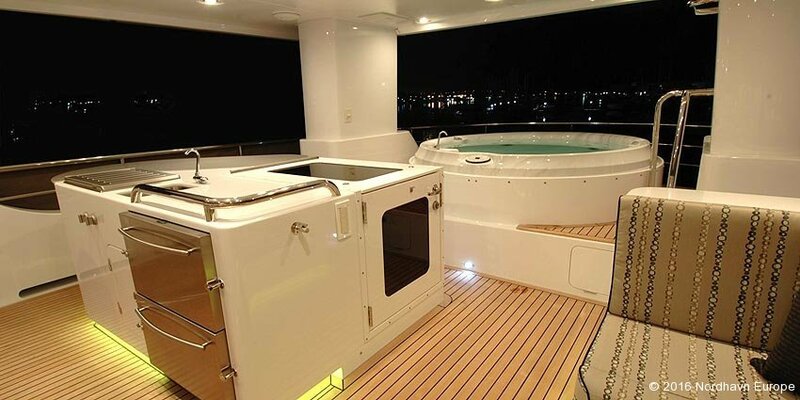 Marquipt davit, chilled water air-conditioning system, 2000 gallons per day water maker, automatic engine room and lazarette fire system with ventilation dampeners, an on-deck Jacuzzi and much more. 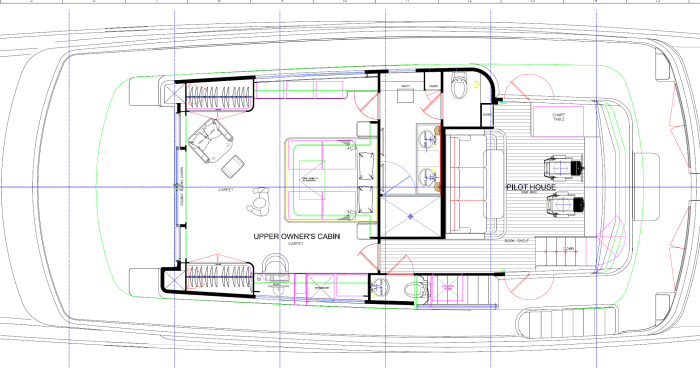 There’s little to add to the Nordhavn 96 except electronics and tenders. As per N86, follow this link. Click the Profile image above to start your PDF viewer. This drawing compares the N86 to the N96 in detail. 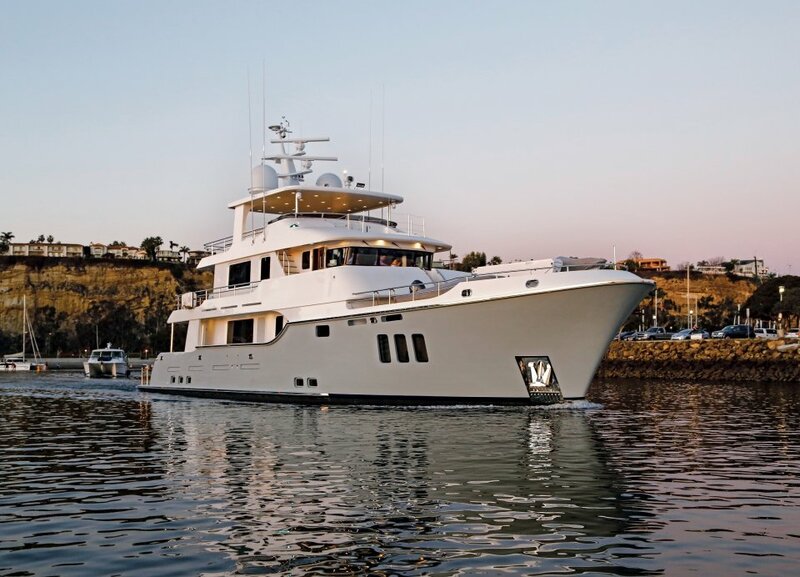 Nordhavn 96 Moves the captain’s cabin to below decks and engineers a massive owners suite on the same level as the Wheelhouse giving outstanding views to the occupants. 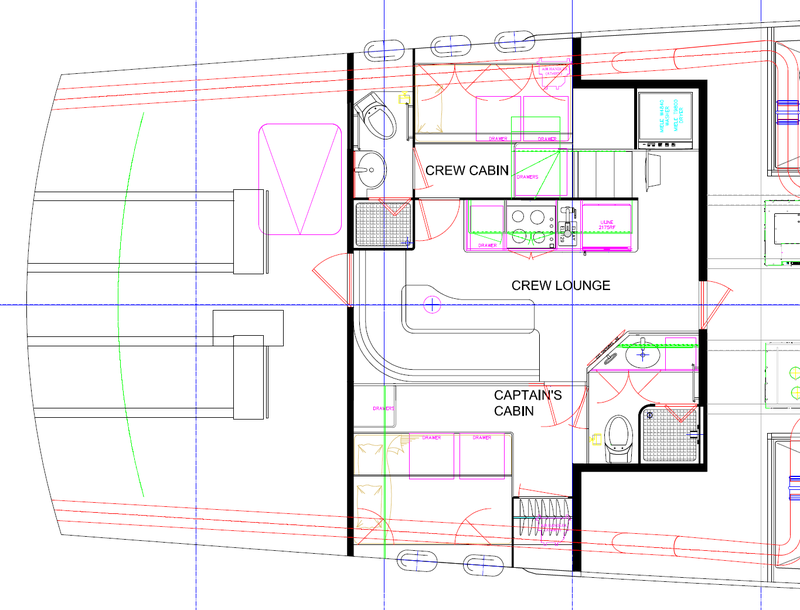 Crew quarters on N96 expanded considerably from N86 to allow crew to live comfortably whilst still being on hand.